You are here: Home » Who is the real villain? Watching the old cartoons when you’re older gives you a new perspective on them. When I saw the below clip I had to change my viewpoint on who the villain was. As most of us we thought that Tom was the bad one of the pair. On the other hand, watch the clip below and you will find that Jerry is wearing the black hat of the pair. The other great things about cartoons of that era is how many times you see things aimed at children that involve smoking, shooting and death! It seems that I’m not alone in this theory of who the villain of the peace is. Villains Wiki has a good page about Jerry Mouse who says that the cartoon should be re-evaluated and not just taken as Tom = bad, Jerry = good as we have grown up with. We do have some footage of Tom actually catching Jerry but what does he do with his prey? He just plays with them until they figure out a way to escape and then Tom is back to square one again with his mistress on his back. Another think that this cartoon showed us at impressionable age was that playing with fireworks, especially large bangers, was fun and a good way to get rid of household pests and something that we always wanted to try but our parents, for some reason, stopped us from doing. There is one person that Tom is afraid of and that is of his owner, Mammy Two Shoes. It’s quite hard to discover who Mrs Two Shoes actually is as, in the canon, it seems that she is the maid to an unseen family or a homeowner. 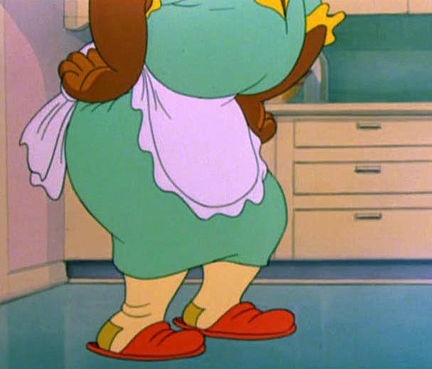 If she actually owns the house then that would be remarkable because of the time that the cartoon was set and a lot of States were still running “Jim Crow laws“.